Overdrive: Silverstone Classic : Facts and Figures. 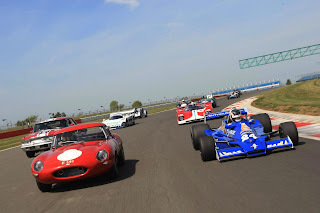 The 2011 Silverstone Classic (22-24 July) can justify its proud claim to being the 'the world's biggest classic racing festival', with the final numbers for the event amply demonstrating the vast scale of this world famous festival. The entire Silverstone site will be taken over by racing, displays, attractions and activities for the entire family, capped by sensational music concerts on Friday and Saturday evening and Sunday afternoon. 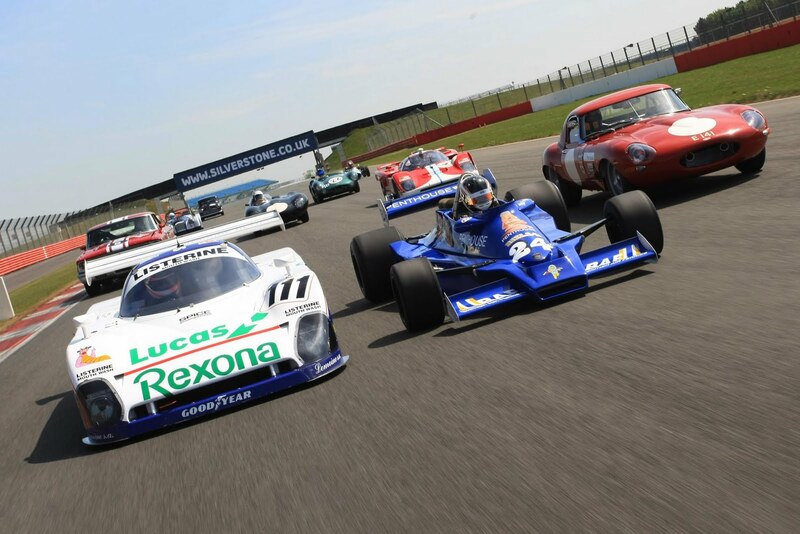 Bigger than any other racing festival, the 2011 Silverstone Classic has attracted massive competitor support across 15 categories and 22 races. In total 1010 drivers are entered. Such is the demand for places on the grids that the existing National Pits and the stunning new ‘Wing’ Grand Prix Pit complex will both be in use. With many of the race grids heavily over-subscribed and at least half of the grids featuring more than 50 cars, a mammoth total of 1030 entries have been received. The spectacular Silverstone Grand Prix circuit can accommodate the biggest grids in British motor racing. With such a stellar line-up of period racing, sports, GT, and saloon cars, the overall value of the cars in action over the weekend has been conservatively estimated at £300 million. A number of individual cars have values in excess of £5 million. 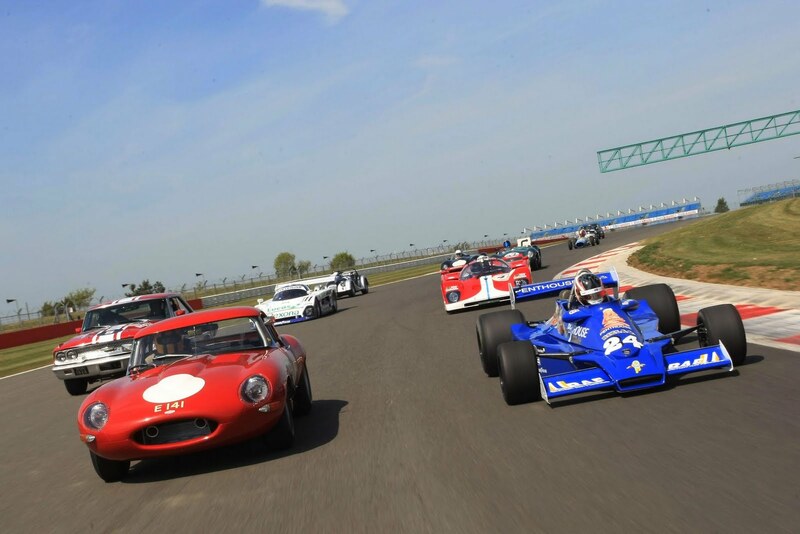 With cars spanning 55 years, ranging from 1928 to 1983, there is an incredible array of Grand Prix cars in action within a total entry of 124 cars. The earlier cars race in the Pre-1961 Front Engine Grand Prix Car races, with the oldest car being the 1928 Bugatti T35B of Geraint Owen. The early 1960s are re-created in the Pre-1966 Rear Engine Grand Prix Cars races, while the Grand Prix Masters races will re-live the 1970s and early 1980s era of the Cosworth DFV engine. Another highlight will be a pair of races for the E-type Challenge, an exciting new series celebrating the 50th anniversary of the Jaguar E-type. 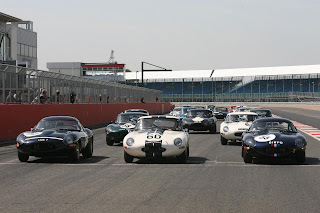 Fifty E-type Jaguars in one race will set a new world record and will make an unforgettable sight. The landmark anniversary of one of the most beautiful cars ever built will be celebrated off-track, with up to 1000 E-types on show and on parade in the models’ biggest ever gathering. More than 7000 classic cars of all shapes and sizes will pack into Silverstone as a host of motoring anniversaries are marked, with a record number of over 120 Car Clubs on show. The response from fans for the 2011 Silverstone Classic has been superb and points to a bumper crowd for the weekend. Advance ticket sales are 90 per cent higher than in 2010. Go on. Someone name them all. Use the comments box! One of the star races will be for the Le Mans-type cars of the 1980s in the Group C category. Cars from Porsche, Jaguar, Mercedes, Nissan, Lancia and Spice will make a memorable spectacle amongst a superb 30-car grid. A gaggle of famous names will be tackling the Silverstone Grand Prix circuit on Saturday afternoon in a special Celebrity Challenge in Morgan sport cars raising funds for the Bobby Moore Cancer Fund. Heston Blumenthal, Jo Wood and Brendan Cole are among those who will be racing in support of the Cancer Research UK Bobby Moore Fund. Major music concerts will maintain the event’s ‘Rocking and Racing’ tradition. Friday will be given over to some of the best tribute bands around, while Saturday’s concert is topped by Suzi Quattro, 10CC and Wishbone Ash. On Sunday the live music content switches to a more laid-back classical focus. Funfairs, shopping malls, an assault course, the Village Green, traction engines, hot-air balloon fly-outs, air displays, festival catering by Jamie Oliver’s Fabulous Feast and even a lawn mower race are all part of the most remarkable show of the year.